← Double-Action Revolvers? Why Not? If you read my last post (Double-action Revolvers, Why Not?) you’ll know that I have been thinking a bit about DA sixguns and their value as defensive tools. In light of that, I thought I might share with you about my favorite double-action revolver; in fact, it’s one of my most favorite guns of any kind. I’m talking about the Smith & Wesson Model 19 with a 2 1/2-inch barrel. When I started my career as a Texas peace officer, my department required that we carry a revolver capable of chambering the .38 Spl. cartridge. Back in those days, that meant you carried either a Colt or a Smith & Wesson. I tried several Colts and they were fine guns, but I finally settled on the S&W Model 19 as the best gun for me. It fit my hand and was a rugged, reliable, and accurate fighting tool. Also, I will admit that the fact that I was a great admirer of Bill Jordan, the Border Patrol fast-draw whiz, had something to do with that selection, too. You see, Bill had a hand in helping Smith & Wesson design that particular revolver. My duty Model 19 was a 4-inch gun but I soon bought one of the new 2 1/2-inch versions for off-duty wear, as did several of my fellow officers. We soon found that this short-barreled magnum was surprisingly accurate and even got our chief, after a trip to the shooting range, to allow us to carry them in uniform. A sort time later, I was promoted to detective and the 2 1/2-inch Model 19 became my regular carry gun. Since those long-ago days, I’ve never been without one. This entry was posted in Guns, Peace Officers, Revolvers and tagged .357 magnum, .38 special, .38 Super, model 19, S&W, smith and wesson. Bookmark the permalink. Back in the 1980s, I had a nickel-plated 2 1/2″ Model 19. I used it to qualify at the range, at the conclusion of a local Sheriff’s Dept. CCW course. Super gun, and of course, like an idiot, I traded it for something, I can’t remember what. My favorites are a 3″ S&W 66 and a 3″ 65 with the ejector rod shroud. I carried a cocked and locked Colt 1911A1 US WWII vintage, an Remington 870 18″ and one of the 66 or 65 as backup. We didn’t get in any real gunfights as we were ready for Bear. We did have to sink a couple of vessels that would not stop. 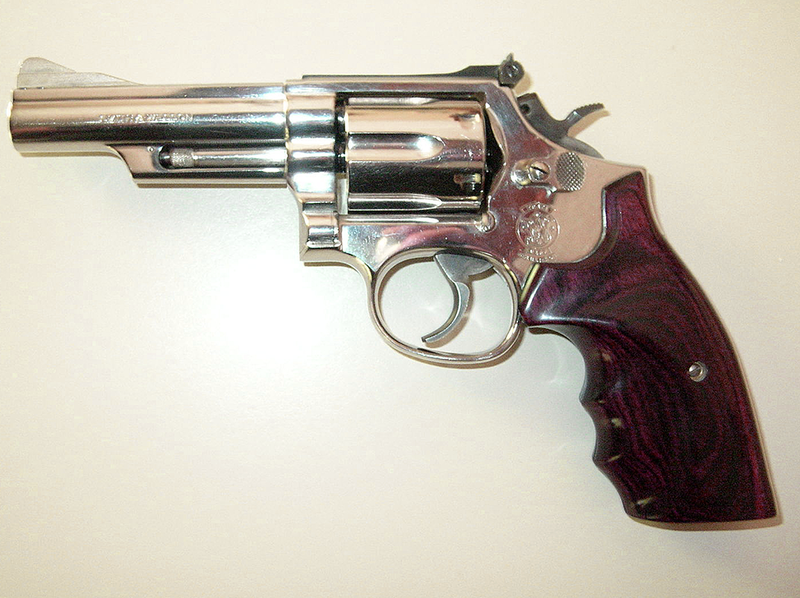 my model 19 is with the 6″ barrel, obviously not for concealed carry – and far and away my favorite of all my DA revolvers!